Over the past two weeks it has been revealed through media reports that mysterious underground fires have been discovered first on April 26 in Thailand. And then yesterday a similar report surfaced from Sri Lanka. Of course the disinfo is rife, and everybody has an opinion re the cause of these subterranean conflagrations from coal seam fires to high air temperatures, none of which are cutting the mustard. Worse still that confirmed peddler of bunk, the Extinction Protocol, has jumped onboard, which is setting off alarm bells for some of us. Would the Zetas please give the final word on this? [and from another] Thailand http://www.nationmultimedia.com/national/High-temperatures-setting-off-fires-underground-30180733.html A senior mineral resources official said initial examination suggested that methane from accumulated sawdust, weeds and dry leaves as well as heat might have caused the fire. Relevant officials rushed to examine a spot in Phitsanulok's Nakhon Thai district where fire has reportedly been raging underground. The fire has also reportedly burned four dogs to death. Resident Chatree Boonyarit also suffered from burns as he tried to rescue a dog in the area. [and from another] Sri Lanka http://www.adaderana.lk/news.php?mode=head&nid=1228 A large crowd flocked to see flames and smoke which mysteriously appeared from a hole dug up in Turai Adi in Kinniya today (May 04). Abdul Kader Farook, who lives near Kinniya Bridge, was digging a hole near his home to dump garbage had noticed flames and smoke coming out of the earth. He had subsequently contacted the police regarding the incident. Police and army personnel were deployed to the location to control the crowds after a tense situation had ensued. The region in and around the Sunda Plate is under intense pressure lately, and this state will continue until the Pole Shift. We have mentioned that the Indo-Australian Plate is a brake, holding other plate movement around the world back. When it gives, there is a domino effect around the globe as other plates then find themselves free to move. Recently a smoking crevasse appeared in the Himalayas, and this type of pressure on rock, which creates heat, will occur elsewhere in the world on occasion too. The Sunda Plate is being pressed into the curve that curls under Sumatra and Java. Thailand is being directly compressed with great pressure from the Pacific and the tilting Philippine Plate. This is not heat from molten lava, not volcanic heat, but heat from compressed rock. It sounds like the ground opened up under the store in Downtown Saskatoon. Would the Zetas be able to comment on the following incident in Saskatoon, Saskatchewan? [and from another] http://saskatoon.ctv.ca/servlet/an/local/CTVNews/20120507/sask-sas-bayfire-120507/20120508/?hub=Saskatoon CTV Saskatoon [May 8] A collapsed storm sewer that flooded an underground transformer vault is being blamed for explosions and power outages in downtown Saskatoon. Hundreds of people were evacuated from residences at the Second Avenue Lofts and an adjacent office building shortly after 2:30 p.m. when a series of explosions under the sidewalk in the 200 block of Second Avenue North spewed black smoke into the air. Investigators have traced the source of the incident to a collapsed storm sewer pipe underneath a catch basin that resulted in the transformer vault being flooded with water. Saskatoon Light and Power says the pump within the vault was working, but it couldn't discharge the water as the catch basin was not functioning properly. A resulting power failure in the downtown area saw business close their doors and thousands of people were asked to evacuate downtown buildings, including Midtown Plaza. City crews were able to restore power to all affected areas before midnight. Buildings have been collapsing, water mains breaking, gas mains exploding, and sinkholes appearing in cities for some time since our 2002 prediction on imploding buildings. What has occurred to date is a single building collapsing when its foundation weakens, or a single street affected by snapping gas and water mains, but not the larger picture we painted. Saskatoon is along a river bottom, and thus in the relatively thin part of the Earth’s crust that river bottoms represent. They are low land, providing an avenue for river drainage because the land has drooped there. Saskatoon is also along the string of lakes that range across northern Canada, representing where Canada has pulled apart in the past during prior Pole Shifts. Saskatoon is thus very much in the stretch zone. What can cities like Saskatoon expect as their stretch increases? Here in this instance we had broken drains moving water from the street to the river affecting the electrical system, but this is just a hint of what is coming. Broken water mains cannot support fire fighters when the gas mains leak and are touched off into explosions by electrical sparks from shattered electrical systems. In designing his cities, man has created the prefect storm for an implosion. Such imploding cities will be found in every stretch zone, down along the East Coast of the US bent into the bow afflicting the N American continent, down along southern Brazil and neighboring countries where the S American continent is likewise bent into a bow, across the swath of Eurasia from the Ukraine to Mongolia, and in the African Rift Valley region which is pulling apart as Africa rolls and drops. Does the big tornado (F1-F2,70km/s) which occurred in Kanto in Japan, caused by " wobble of the earth? We predicted in 1999 that tornadoes would start appearing in unexpected places, and this has steadily occurred. Our prediction was, of course, due to the Earth wobble which we knew would ensue after Planet X arrived in the inner solar system. Tornadoes have occurred in the Southern Hemisphere in Brazil and Chile, and in Europe, and tornado alley in the US has been severely afflicted. The wobble will only get worse, and those countries along ocean coastlines will find they are beginning to experience tornados. This is absolutely a wobble induced phenomena. Will the happening like the spring on Arab happen in China? The Chinese people are not at the point of rebellion, as were most of the Arab countries prior to the Arab Spring. Their women are not required to go about draped completely in black, in a burka, as is true in many part of the Muslim world. Nor are women stoned for driving a car or having an affair. Where parental meddling in arranging marriages certainly is known to occur, it is not equivalent to the forced marriages arranged in Arab countries. If communism in Russia collapsed due to economic conditions and the Arab Spring occurred due to combination of oppression and poverty, what would be the factors to cause a rebellion in China? They are, economically, on the upswing, and the people steadily given more freedom. China will prove to be one of the most stable countries, going into and past the Pole Shift. I have read that the Zetas say there will be no power leading into the actual pole shift. How will this occur? Will it be from some kind of EMP, or from natural disasters such as earthquakes and tornadoes? How long of a period before the actual shift will power be lost? This would allow for better preparation for everyone. Given the hype from NASA over solar flares causing electromagnetic damage and fires in the past - the much touted 1859 solar flare episode – just how will man’s electrical grid meet its demise during and leading into the Pole Shift? Of course electro-magnetic surge will destroy some equipment, but that is not the main reason the grid will be down and irreparable. Man is used to thinking of the grid as so solid that only an occasional part need be replaced or repaired - a transformer explodes when a squirrel makes a connection while running the wires, lighting strikes so a fuse blows, or a storm blows a tree down on some wires, breaking the grid. Send out the repair trucks and all is back in order. So why won’t this happen after the Last Weeks and the Pole Shift have passed? Mankind’s electrical equipment is immensely complicated, built on the assumption that the Earth provides a stable environment and parts can be readily purchased or located and replaced. The profit motive drives the process, with durability the last consideration. Even the military, whose specifications demand equipment that can survive in the field – isolated and under bombardment and harsh weather conditions – saving money is the prime consideration. Thus the broken link rules, and when parts are not available, the grid is down. How extensive and pervasive will the breaking of the grid be? It will be broken link compounded by broken link in an unending string of broken links. Roadways will be impossible for trucks to navigate so replacement parts will not be delivered. Skilled technicians and electricians will not be available, as they will be distracted on their home fronts or be struggling with insanity or injury. Even if the grid is repaired in a locale, generating electricity from broken power plants or plants without fuel will prove impossible. We have encouraged survival communities to rely upon wind or water power, with a simple and easily repaired setup. A home-made windmill setup from car parts and a battery bank that can be refurbished to run forever will provide the community with lights and power for equipment such as short wave radios. Prominent Japanese astronomer Koh-Ichiro Morita died under mysterious circumstances in Santiago, Chile. His work on the international ALMA radio telescope project was widely noted. His personal items were reported to have been stolen during the assault. The untimely death of this scientist and the opportunity for his research to have disseminated information about Planet X begs the question whether TPTB had their hand in yet another criminal act. What is different here, though, is the immediate news coverage received. Would the Zetas kindly comment on this unfortunate situation? [and from another] http://ilovechile.cl/2012/05/09/pdi-search-japanese-astronomers-killers/55907 Preliminary results from the autopsy suggested that the victim received a strong blow to the head, resulting in a cerebral hematoma. Koh-Ichiro Morita had been in Santiago for the last two years working in the Santiago headquarters for the Atacama Large Millimeter Array (ALMA), the largest astronomical project in existence. The project aims to build a huge telescope using 66 large antennas, providing an unprecedented view of the galaxy. Morita was re-assigned to the country in September 2010. [and from another] http://tv.ibtimes.com/japanese-astronomer-found-dead-in-chile/5489.html Koh-Ichiro Morita was found still alive outside his apartment at around 2 am morning reportedly with an injury to the head. He died nearly six hours later at a nearby hospital. Investigators have not yet determined the cause of death. Local reports indicated Morita did not have visible injuries, though a medical report supposedly mentioned a brain injury. Morita worked the past two years at the Santiago headquarters for the Atacama Large Millimeter Array (ALMA) in Chile's northern Atacama Desert. Was Koh-Ichiro Morita assassinated on behalf of the cover-up? Staged to look like a robbery, the death of this mild-mannered man has raised eye-brows around the world due to the increasingly wide-spread awareness of the cover-up over the presence of Planet X. More than the astronomical community is being put on notice by this assassination, as his work on the Atacama Large Millimeter Arrays in Chile will be recognizable to all from the movie Contact, where such an array was central to the script and where the cover-up over the alien presence prevailed. Lately the cover-up has gotten vicious and forceful, as they sense they are about to lose the battle. Morita was one member of the community who was restless, and did not like being ordered into silence on a matter so vital to the inhabitants of planet Earth. His death was sent as a message to others of like mind. Where many people are offered protection from the Council of Worlds, others chose to allow their death to be a rallying point, by becoming a martyr. Wellstone, the beloved Senator from Minnesota who died in a place crash at the hands of the Bush administration was one such, preferring as a martyr to incite the public to fight. Yet more people are now aware of the cover-up and the means it uses to maintain silence over the presence of Planet X. But likewise yet more people are now enraged and determined to see this situation change. The battle over the cover-up is becoming more polarized. Morita’s death has been announced as brain damage from a blow to the head, but as news articles show, this was not evident when he was found, unconscious, nor is it logical that he would be in hospital for 6 hours yet not be saved. The skull is opened to relieve pressure if bleeding is present. He was slipped a poison, ingested prior to returning home, where he collapsed before getting to his apartment. This was not enough to kill him, a botched job, so he was finished off in hospital. I wondered Zeta's a comment about SOHO's latest on-again/off-again problems were the cause of PX's influence or is NASA playing hide and seek with the data so we can't see what is in the images? Or will they blame the disruption on those big, bad CME's? [and from another] LASCO 2 and 3 is missing data since May 3 16:18. The last time SOHO went down was on June 24, 1998. http://sohowww.nascom.nasa.gov/operations/Recovery/recovery_diary.html They had no contact with the craft for more than 1 month and 3 months passed by before SOHO was back into ‘normal mode’. [and from another] http://sohowww.nascom.nasa.gov/datarealtime-images.html NOTE: LACK OF DATA UPDATES. SOHO went into "Emergency Sun Reacquisition" mode on Friday May 4, 2012, caused by a false trigger of the Coarse Sun Pointing Attitude Anomaly Dector. We are working on the recovery of the spacecraft to normal mode. Nominal science operations should be re-established in the next couple of days. Is the SOHO satellite in trouble? The much accessed LASCO images in red and blue have been eliminated, while the close-ups of the Sun that support NASA’s claims about sunspots and solar flares are still available in some format. Is the SOHO satellite damaged, malfunctioning, or in need of adjustment? There is nothing amiss with the SOHO satellite, and it is still streaming data. NASA is using an old excuse from 1998 to explain why they are no longer providing images to the public. Changes were made to the programs that control the SOHO satellite after the 1998 incident, to prevent a repeat, but this is brushed aside as they need some excuse for withholding the images from the public, who of course pay for the entire NASA operation with their taxpayer dollars. What changed? Polarization in the cover-up war has intensified. 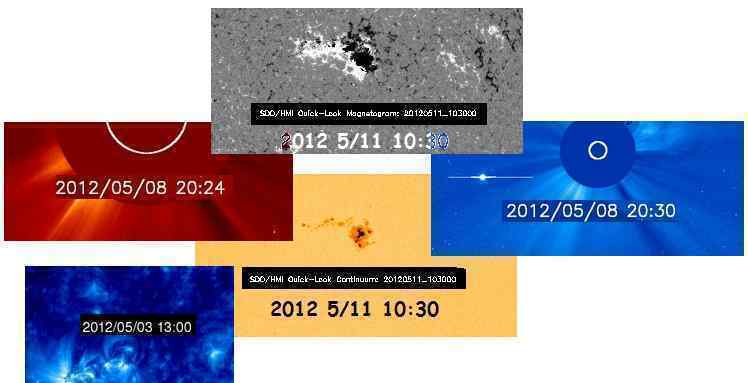 Images from the NICT Magnetic Simulator were already halted at the end of March, 2012 because it so clearly showed a magnetic presence other than the Sun twisting the Earth’s magnetosphere. And if the media dare feature their SOHO images showing the Checkmark Moon Swirl, as they did on March 27, 2012, then what can be coming next? They will likely return with changes that require them to withhold the images for a longer period, to allow proper elimination of any evidence of the Planet X complex. Fewer images, more carefully edited. Those with a large archive of SOHO images, showing clearly that Planet X and its large trashy tail is riding near the Sun, should treasure this archive, as it is likely to be the last such opportunity to get NASA to cooperate, however reluctantly, in providing evidence of the Planet X complex in the inner solar system. The Zetas have mentioned souls that technically can graduate to 4th density, because of their spiritual growth but hold back in 3rd density to assist in the Transformation. Can some souls also go to 4th density and then return to Earth, for such service? They would not technically be Star Children because they came from Earth, very recently. They are spiritually 4th density but physically 3rd density. These Earth souls would have a tendency to be very honest with themselves and others. Does this happen, and what are the characteristics of souls returning souls. Could the Zetas clarify? It seems like this is about Star Children but in a different context, related to Earth souls who return. We have mentioned the reluctance many in the Service-to-Other have about being promoted to 4th density Service-to-Other worlds, as they desire to remain and help their birth-mates make the grade. They decline the promotion, during the periodic harvests, and determine to remain with their birth mates until the Transformation, when all will in any case be sorted out into their future worlds. Those who linger in this manner are staying in a world fraught with danger and suffering, as all 3rd density worlds are, sacrificing their own comfort to help others, a true hallmark of those in the Service-to-Other. These souls are equivalent to Star Children, essentially from a higher density, yet are Earth born. What is life like, after having glimpsed what the worlds of those fully in the Service-to-Other are like, the cooperation and support given to one another in a high tech existence? These individuals are quite clear on what the goal is, how life among those in a Service-to-Other community proceeds, and can see with great clarity the deceptive picture drawn by those in the Service-to-Self. Where the Service-to-Self claim that rituals and enforced ignorance and rules against personal freedom are for the betterment of mankind, those who have glimpsed what awaits after graduation are acutely aware that this is a falsehood. Thus these entities, who might be called a big brother or big sister, spiritually, can usually be found on the front lines of the battles with those in the Service-to-Self.